Nowadays, most audiophiles are aware of the supporting materials influence on the musical reproduction. Reason for that is the resonance response that all gears such as amplifiers, CD players as well as D/A converters etc. are permitted to generate, causing coloration and masking of the musical reproduction in the frequency spectrum where the material and the coupling resonance appear. Traditional solutions, that uses some from of rubber puck or a cone trying to achieve better low level information, improved soundstage, increased separation of instruments, more detailed overtone spectrum or a better transient response but realize that there are no mayor improvement. All that happens is a tonal shift, with accentuation of a specific frequency area. This might affect the tonal balance of the system, and in some situations it might be beneficial. With more than 15 years of experience in optimising high end audio reference systems, we wanted to developed and design an audio support system that is not merely a carrier or holder of equipment, but rather an important component in the system. By implementing highly efficient isolation and resonance control system, we allow the audio system to unhindered reproduce all the emotional and expressional qualities of the music. Using a support system without a tone or signature of its own make listening a truly High-End experience. The Disc of Silence is the ultimate set of isolators for heavy amplifiers and unevenly distributed loads. The hight is adjustable to provide easy installation and precise levelling. 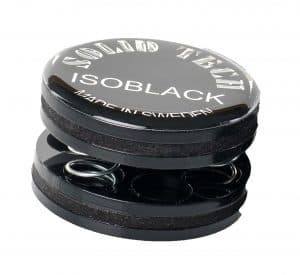 Tech details: For optimal isolation should each disc be loaded with minimum 5 kg. 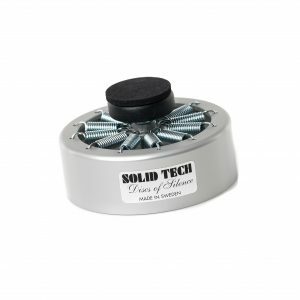 A set of 3 discs effectivelly isolates 15-35 kg, or up to 70 kg with optional extra three springs per isolator. The HD variant uses maxiumum 12 springs pre unit and with max load of 45 kg per isolator. ISO Black offers ease-of-use and high-end performance at an affordable price. An extensive vibration analysis made by an independant institute clearly shows its effectivness even at the lowest and most offending audio frequencies. Tech details: Optimized for equipment from 5-15 kg and by adding extra springs allowing additional support of 11 kg per foot. Feet of silence is our most revolutionary of isolator. The extreme isolation capability both vertiacally and horizontally makes this our state of the art isolator for medium weight equipment. 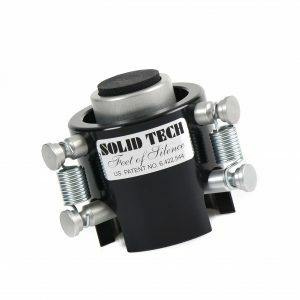 Tech details: 3 isolators can isolate a load of 5-15 kg, or with High Density (HD) springs 15-40 kg. With 4 isolators, the extra load increses with 25%.